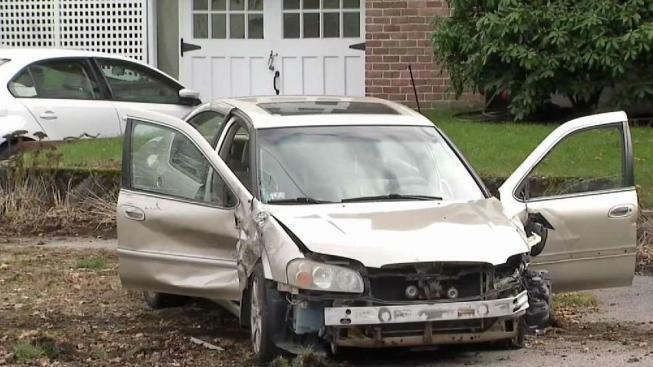 A driver has been arrested for allegedly striking a landscaper and hitting several other cars during a chase in Milton. According to police, an officer came up on a minor motor vehicle crash on Adams Street at Brook Road. Just as the officer was approaching, one motorist fled the scene of the crash without making himself known. This suspect vehicle turned onto Brook Road, police said. The officer activated the lights and sirens on his cruiser to stop the vehicle, but the suspect refused to stop. Moments later, the suspect vehicle, a 2003 Nissan Maxima, crossed over the double yellow lines and passed another car in traffic. The officer then stopped attempting to pull over the vehicle. According to police, the Nissan continued and tried to pass another vehicle on Brook Road, but it sideswiped the vehicle. The Nissan then struck a pedestrian who was outside of a landscaping vehicle on the other side of the street. The Nissan continued onto the wrong side of the road where it struck another car that was parked and occupied in a driveway, police said. The driver tried to flee on foot but was apprehended by an officer. The pedestrian who was struck was transported to the Boston Medical Center. The susupect that was taken into custody is a 32-year-old homeless male, police said. He has been arrested for operating under the influence of drugs causing bodily injury (felony), receiving a stolen motor vehicle, leaving the scene of a property damage accident, leaving the scene of a person injury accident, suspended license, refusal to stop for police, refusal to identify himself and two outstanding arrest warrants, one for receiving a stolen motor vehicle and another for larceny under $1,200. He is being held at Milton Police Headquarters and will be arraigned on these charges Monday in Quincy District Court. It is unclear if he has an attorney. Police shut down part of the road for hours. A woman who lives nearby says someone hit a landscaper before crashing into other cars. At the scene, NBC10 Boston spotted three cars that appeared to be involved in the crash as well as a garden rake, a pair of headphones and a hat on the ground near a landscaping truck. A woman who lives nearby told NBC10 Boston off camera that she watched emergency workers carry away an injured landscaper who she saw lying on the ground.